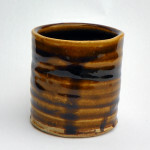 A single stem of flowers and a drop of local clay on the handle bring warmth to the honey glaze. It seemed a shame to spoil the pooled throwing marks on the blank side of the pot, so it was left that way with the golden colours taking centre stage. This cup feels like a warm autumn as the leaves turn golden as the days get shorter, just before the strong winds of late October. This collection of pots feels so hopeful for the future, like I am making progress. M4 was given to me at the International Ceramics Festival 2015, at which I was a volunteer. 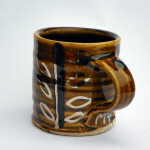 I met the mug’s maker, Joseph, on the day he arrived. Iwas impressed not ONLY by his height – it’s always ood to meet other tall people! – but by his thoughtful, intelligent manner, and his gentle way of talking. Joseph was instrumental in raising the profile of the festival on social media, and , if the organisers have ANY idea of what would serve them well, will be employed next time well ahead of the festival, as well as during, to increase interaction with interested parties online. Joseph put me onto the idea of getting onto Instagram, which I have done, and find it great for inspiration and support from artists all over the world. I first used the mug when I got home to Birmingham. I have mainly drunk coffee from it, instant, for the most part (Sainsbury’s Gold to be specific) but at weekends I have ‘real’ coffee prepared in a cafetiere (again, Sainsbury’s, basic range!). 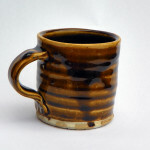 I very much enjoy using a drinking vessel when I have a personal connection to the maker.I like seeing the signs of making in the surface of the glaze and the slip, the wire marks on the base, and the way the handle is formed. I have many MANY mugs, and M$ sits happily with them when not in use. It joins mugs from Singapore, UK, China and Hong Kong as well as charity shop finds on the shelf in our flat’s kitchen. No-one else but me has used M4 yet. I don’t think that that’s a rule – I just don’t think I have yet wanted to give it to anyone else.. time will tell! I am really really pleased to have met Joseph and to have been given a piece of his work, It is valued for its own sake, but much more so because of this. Thank you – and see you on Instagram!